When something is super-successful and is nominated/wins awards, there's a good chance that there will be a follow-up sequel or expansion to it. Well, the original Spyfall card game was super-successful and was nominated/won some awards. As such, Cryptozoic and Hobby World are bringing you Spyfall 2. 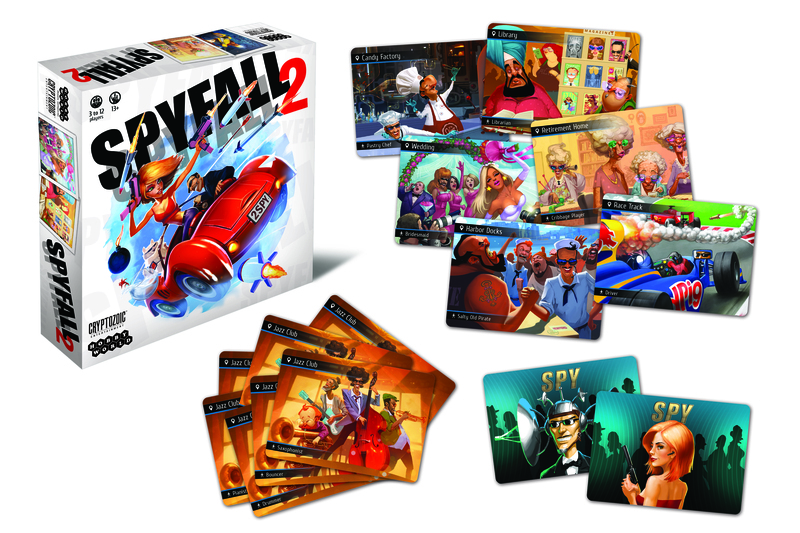 Spyfall 2 expands the first game, featuring 3-12 player capability, up to two spies, and 20 new locations. It is a standalone expansion, meaning players can play it by itself or combine it with the first Spyfall to make the experience even more complex and challenging. The game’s 20 new wacky locations include the Retirement Home, Candy Factory, and Prison. Players who get location cards also receive suggested roles for those locations that they can utilize for added fun. Whereas the first game only allowed for one spy and a maximum of eight players, the sequel increases the possibilities with up to two spies and 12 players.